The Mediterranean Sea kisses the shores of Italy, Greece, Spain, Turkey and other warm countries, the cultural mixture of which resulted into the emergence of a self-titled interior style. Just like these places of the globe, the Mediterranean style embodies light and relaxed atmosphere of the afternoon siesta. Such an interior mood is the choice of people, who value simplicity, utility and ultimate comfort. Its fans are usually people tired of big-city life and being dead against ostentation. And what is the most important room of a Mediterranean house? Right, it’s a kitchen! The kitchen we’d like to show you today is designed in a Mediterranean manner: the role of a centerpiece is given to an island. Its construction is equipped with a cooker, a bar table, and a storage area, which enables the hostess to prepare delicious meals right next to the cooking top and have full control of the cooking processes “on fire”. 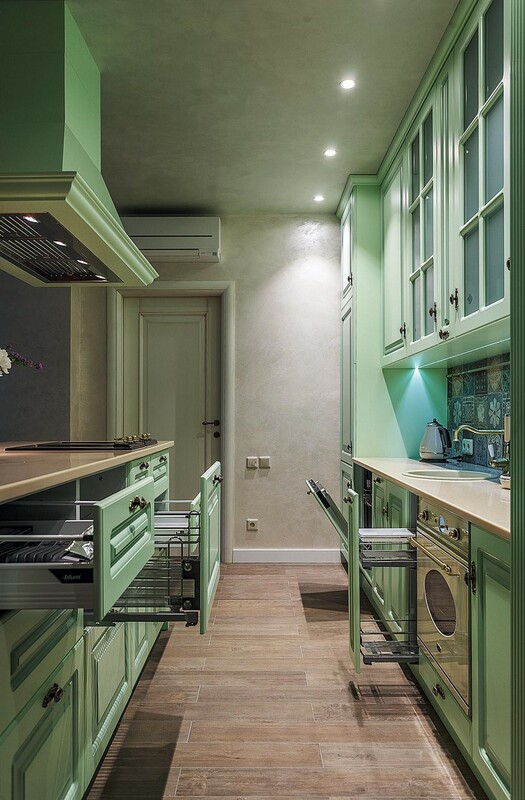 A typical Mediterranean kitchen is traditionally furnished with solid, durable, and, as a rule, natural wooden cabinets, as well as numerous open racks. In this project the idea of open racks was abandoned due to the fact that the kitchen is open-concept to the living room and keeping it neat and tidy is easier when you have as few open surfaces as possible. 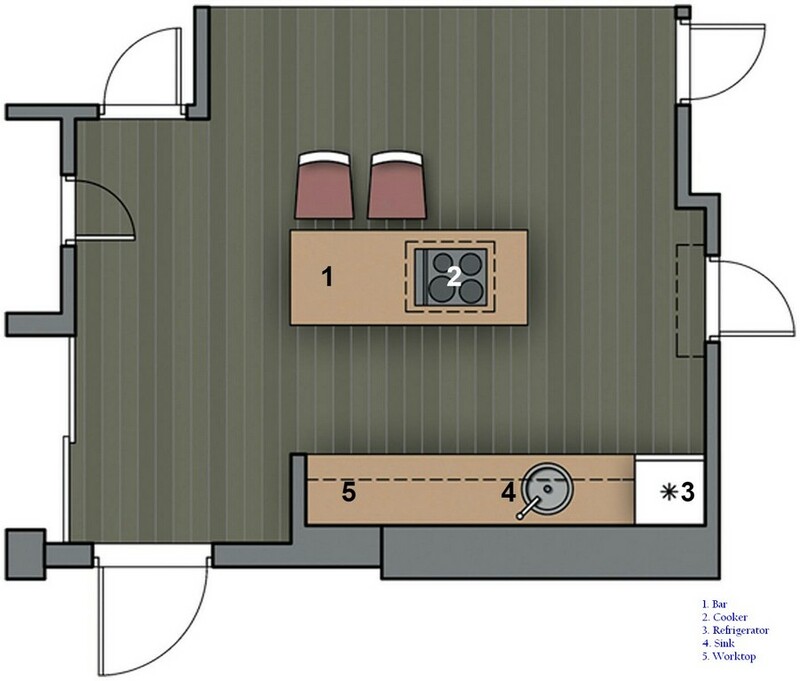 Besides, the relatively limited total area of the room (9.3 square meters) didn’t allow for arranging open shelves that take away mush useful area. The countertop of the island is a little bit wider than its base on its seating side, and hence the knees of guests wouldn’t be confined to the doors of cabinets. Arranging a cooker hood in the middle of the room, which is a quite non-standard solution, wasn’t a problem from technical aspects: the ventilation skip is concealed above the dropped ceiling, which was made from a metal framework and sheetrock. Two-level ceiling additionally zones the space, visually separating the prep area from the living room. 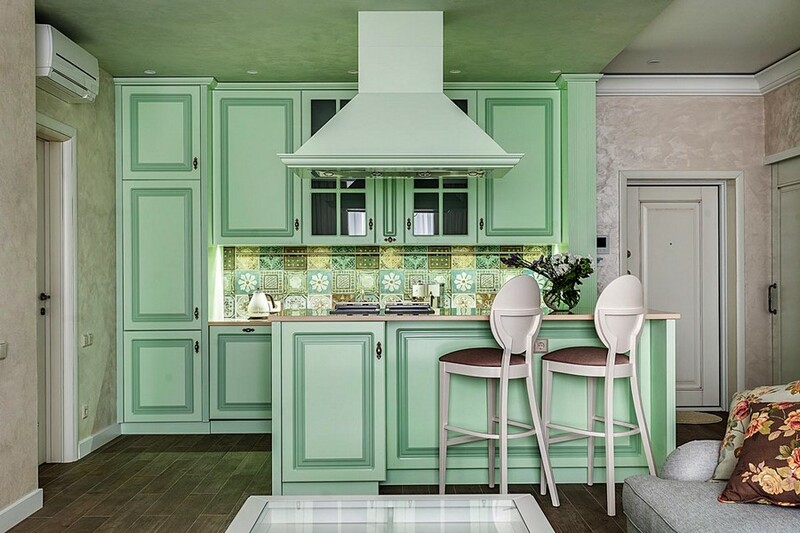 In one word this kitchen interior can be described as “feminine”. It’s fully based on the mistress’ personality: there is not a single brutal color here – just tender and delicate tones. 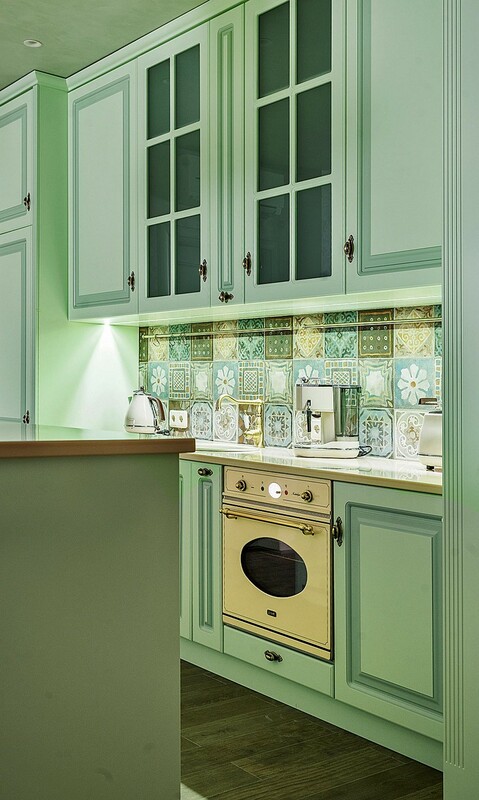 Pale green cabinet doors, which are, by the way, typical of Greek interiors, are framing a totally Mediterranean multicolor backsplash composed of square tiles. This is in fact the only bright splash in the room – the designer deliberately rejected any contrasts. Even the worktops and sink are cream beige. An important detail bringing the note of warmth to a somewhat cold palette is brass; it’s represented in small, yet important details, such as a faucet, door handles and rails.